‘Leave no-one behind’ is the deceptively simple goal used to sum up the UN ‘Sustainable Development Goals’– a grand plan for a better world for everyone – signed off by member countries in 2015. It’s a hugely ambitious framework aiming to make the planet and its people prosperous into a secure future. With seventeen goals and 169 targets to be achieved by 2030 it seems likely to launch a whole industry of monitors and evaluators trying to figure out what progress is being achieved. But how about looking a that one overarching goal? I’m doing some work on how this global framework reaches down to national, regional and local level, making a difference to peoples’ lives. Last week that took me to Manila, capital of the Philippine islands. While I was there I was fascinated to see what it means to leave no-one behind. Manila is a good place to ask the question, as cities like this are taking over the world. More than 50% of the world’s population live in them, 68% projected by 2050. Cities experience growing pains, and one evidence of that is over a billion people across the world living outside the regular systems and formal economy, unregistered, bartering, unable to vote, lacking basic services, in the ‘informal sector’, many in the slum areas of cities. Shanties and shacks are jammed into the pockets of land no-one else wants, next to swamps, rivers, dumps and other low-value sites, scraping a living as more and more migrate to the cities from poverty-stricken rural areas in search of work. Manila is capital of a country sometimes referred to as the world’s ‘disaster laboratory’, striken by regular typhoons and straddling a fault which threatens ‘the big one’ – a predicted devastating earthquake above the ‘West Valley Fault’. Its government are well aware of the need to protect their people. Most recently Typhoon Haiyan devastated huge areas of the country, concentrating minds even more on keeping its people safe. The city’s investing huge amounts in Disaster Risk Reduction to protect people from these oncoming disasters. 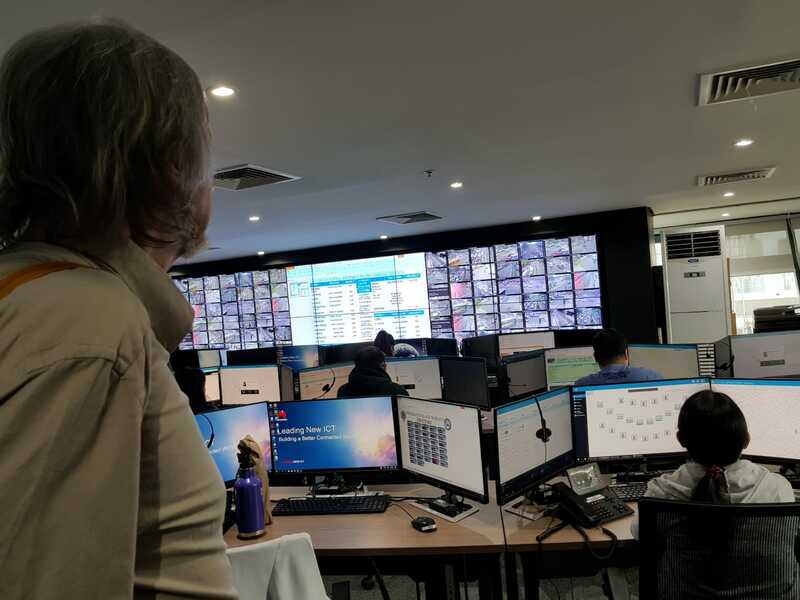 Take the lift up one of the city government’s high rise offices to a disaster control centre and you’d be forgiven for thinking you’d walked onto the set of a Tom Cruise sci-fi film. A huge wall of monitors beams data into the control room. Staff dressed in black and orange emergency gear scurry around. We’re shown a battery of films shot from swooping cameras and drones depicting emergency vehicles, equipment and drills. There’s a lot of machinery here. The music is fast and techno. What’s the answer to our question? Is no-one being left behind? The city is clearly spending big money on protecting its citizens . . . But which citizens? As we drive through the city we see clusters of skyscrapers. Business buildings, condominiums. The pressure on the land is tremendous. There are cranes everywhere, new blocks rising into the sky. In between this slick high-rise development is a very different kind of city. Cramped clusters of shambling buildings filling in spaces and straggling along the rivers, jammed together, clad in wood and tin. This is the informal sector. This is where many people are in danger of being left behind. Do the sophisticated systems and control centres take these people into account? 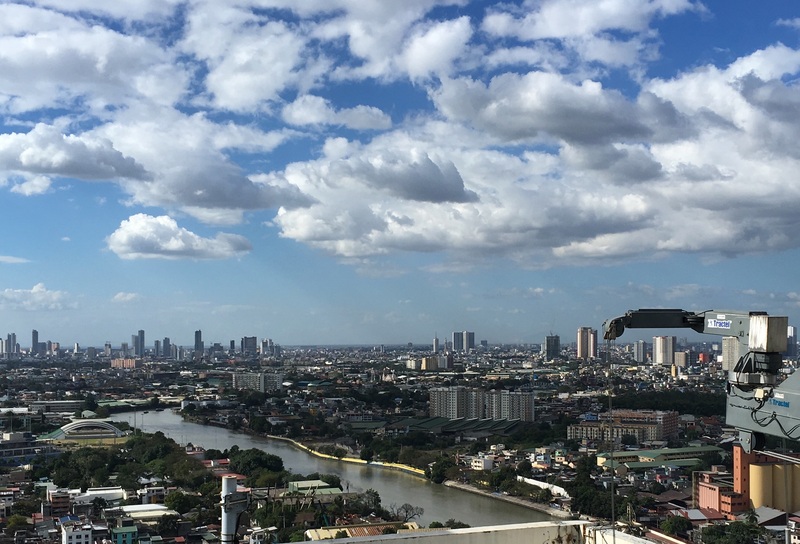 It’s an important question as it’s estimated that a million people live in these areas of Manila Bay, and it’s well known that – lacking proper buildings and services – they are the most vulnerable to disasters both large and small. The answer we are given is simple. These people are being moved out. Relocated. That’s not surprising in simple economic terms as they are squatting on land which has now become valuable, where the next high-rises could be built. Relocation solves a problem for the city, but does it solve the problem for them? Even the people explaining this policy say no. Plucking people out of their established homes doesn’t only take them away from what they know, it takes them away from their income. Whatever work they have is where they live and when they are moved out of the city, maybe to the mountains, they are not only emotionally but economically dislocated. The people who explain this policy recognise this problem. But they didn’t have any suggestion about how to address it. A whole industry of consultants and accountants may be making good money from sophisticated evaluations of progress on the 169 targets of the sustainable development goals, but a much simpler evaluation of the overarching goal – leave no-one behind – suggests that this may not be high on this city’s agenda. I’ve seen and heard similar stories in other megacities: Delhi, Cairo, Ho Chi Minh City. ‘Leave no-one behind’ is a wonderful aspiration. The reality in many countries is ‘Leave them out’ or in my own home country, the UK, ‘Keep them out’. Disaster Risk Reduction and Resilience are taken seriously, but shaped towards the wealthy middle classes and the business sector, whereas those most vulnerable to disasters are the poor. How will the UN square this circle? My own experience from years working on alternative community assessments of progress is that by making the targets, indicators and evaluations sufficiently complex not only can you finance an industry of well-paid consultants and economists but you can throw up a smokescreen of complex reports and metrics so no-one notices the lack of progress towards the underlying goal. 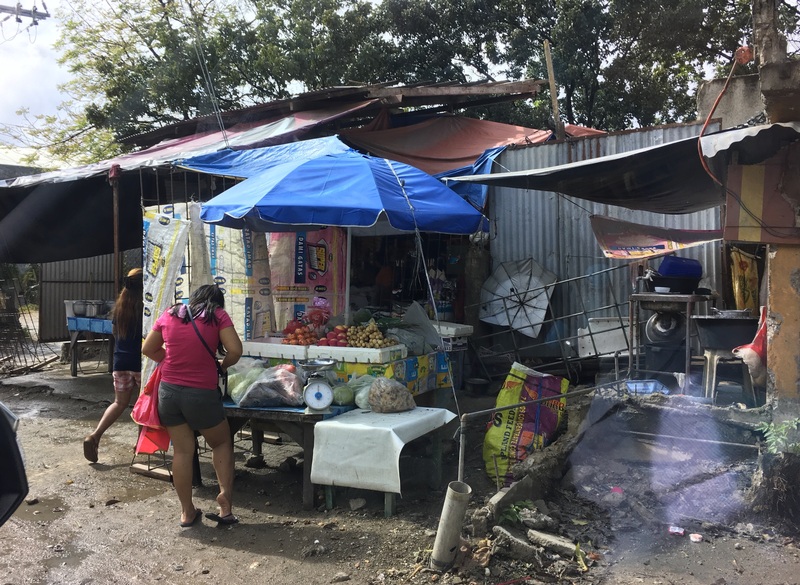 To end on a positive note we went to another Philippines city and talked to a member of the city council’s housing committee about their approach to those living in the shacks and slums of their city.Their solution? They’d bought up a disused cemetery and were in the process of building 600 houses on it to accommodate many of the slum dwellers, within reach of their old homes. Leaving no-one behind is possible. Leaving people out is easy. ‘Making Aid Agencies Work’ is a book I’m publishing in spring 2019. What right have I to tackle the title’s challenge? My publishers and I finally came up with the title yesterday after months of discussion while the book itself was being written. It’s an audacious claim and there are many better placed to advise than I am, so what do I bring to the feast? The answer lies partly in the subtitle: ‘Reconnecting INGOs with the people they serve’. My experience, interest and research are all about how people learn and act. Through a million miles of travel to see aid agencies in action, through working shoulder to shoulder with them and through researching their history and development I’ve shaped my thinking. How can aid agencies unshackle themselves from the treadmill of providing services, often filling the vacuum left by reduced social spending, and live up to their website front page claims to end poverty and empower people? Is there really a problem that needs solving? Early this year there was certainly some very bad press about major INGOs. As I was writing this book several people asked whether I was just piling on the pain. Plenty was being written already about problems with INGOs. My answer is that the issues which surfaced this year represent the tip of an iceberg and one has to dig into the history and economics of INGOs and the surrounding political scene to understand what lies below the surface of the water. Once you do that, I argue, you find that there’s a whole structure out there which disconnects INGOs from the people they serve. How can that structure change? The book focuses on the roles of learning, knowledge and power and I’ll outline some of its thinking in further posts. Of course you can read the book when it comes out next spring! Ben Wisner and I received the ‘outstanding paper of the year’ award from the International Journal of Disaster Prevention and Management for our paper ‘Lets Talk about You’ published 2016 (and available in ideas and stuff ). You can read about it here: http://emeraldgrouppublishing.com/authors/literati/awards.htm?year=2017 There’s rather a long list of awards so you might take some time finding it! Encouraging as we’re now working on a whole guest-edited issue for the same journal. I’m writing a book which invites readers on a journey to many different cities, towns and villages around the world. It’s a travelogue but it’s more, because in sharing my journey I’m sharing a million miles of air travel and a quarter of a century of field visits during which I’ve discovered many of the challenges and complexities of what we call ‘development’; and I aim to share that journey of ideas, too. I’ve attached here an early draft of a chapter from somewhere in the book (all the chapters are designed to work on their own, as well as adding up to an overall journey) and thought I’d invite some early reaction from anyone prepared to read it. This chapter centres on a journey taken on the edge of the millennium, to one of the remoter places in the world. I hope this is interesting for you and I hope for feedback which is enlightening for me. Please comment at the bottom of the blog. Don’t be polite! Resilience is a weasel word; by which I mean it sounds really good and really useful as an idea until you move closer to it when, like approaching the end of a rainbow, it evaporates. Some people try to explain it as ‘bounce-back’, hence this blog’s title. Some say that we don’t just want to get back to where we are, but to move on, so they talk about ‘bounce-forward’. Resilient, or bouncy? Either are quite hard to pin down because they bounce around so much. The problem with metaphors is that they are seductive. Because we notice that something is like something else we start to think it can be explained in the same way. A term originating in engineering has been applied to biological ecosystems and more recently to human society and human individuals, but it is just that, a metaphor, it doesn’t of itself ‘explain’ though people often fall into that fatal trap. 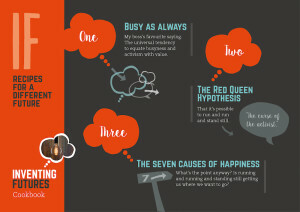 Metaphors aren’t the answer but they are a great way of starting a conversation. Whilst, working in the field of international development, I’ve been fascinated by the relevance and limitations of the idea of resilience in community development (see for example our work on Frontline) What I’m interested in at the moment is the idea of personal resilience, which is much discussed in the worlds of coaching and self-management (for example of humanitarian field workers facing stressful situations). Resistance. I remember listening to war reporter Martin Bell in Anthony Clare’s Psychiatrist’s chair (A BBC radio series) twenty years ago. Anthony tried to tease out the impact of Bell’s harrowing experiences in the course of his work and his response was entirely old-school stiff upper lip, emotionless, ‘ramming it down inside’. He clearly had a coping mechanism, and Anthony tried and largely failed to uncover the emotional effects of Bell’s experiences. More recent work to support those exposed to such traumas has recognised that more than coping is needed . . . Adaptation. There’s now a wide body of work on wellness and resilience for people exposed to trauma as humanitarian workers, soldiers, reporters and others. Terms such as PTSD are much more widely understood than twenty years ago. Such work aims to prepare people for what they will face. It encourages them to be self-aware, it shows how to maintain some personal space for reflection. It uses tools like ‘mindfulness’ to help in this. It places an emphasis on maintaining social and personal relationships to build a support structure, and of course on careful management of personnel. It acknowledges the need to debrief and adjust, rather than just ‘ramming it all down inside’. This is clearly a more thoughtful approach than just encouraging people to ‘cope’. However just as in Pelling’s discussion of the idea of resilience in international development the question is whether just want to make the status quo more sustainable, or whether we really want to ‘bounce forward’ . . . Transformation. Let me say that this is where my heart lies. In my own work I have travelled about a million miles visiting development projects in villages, towns, cities and slums across the world and the sense of a huge investment of effort and yet a persistent sense that nothing much changes has led me to start work on a book ‘Watching the World Standing Still’. the idea of transformation, again discussed in Pelling’s book and in our collaborative paper, is that we set out to change the things that shape our lives – the system, or the underlying factors. Now this seems to me important at a personal level, and also in organisations. In particular I’ve seen this in development and humanitarian organisations . At worst adaptation can be a psycho-social elastoplast; keeping us on an even keel so we carry on. I have a colleague who’s thinking about this and about how particular people have transformed their lives, realising that they needed to do more than just cope or adapt. Often their transformation results, bluntly, from dramatic personal loss or trauma. This is not inevitable but neither is it surprising as we all, individually and organisationally, resist change – a preoccupation of mine as you’ll find here. Often it’s an external force that pushes an individual or organisation beyond their ability to resist, creating sufficient disruption for change. But is waiting for the collision really the best we can do? Or should we, as we think about wellness and resilience, be helping people to consider the need for transformation in their lives, asking whether their current values and behaviours really reflect where they might want to bounce forward to? This seems important to me both for the individuals, and for the organisations and enterprises they are part of. If individuals deal with their challenges through resistance and adaptation, in other words ‘business as usual’ then those organisations of which they are a part will also tend towards ‘business as usual’; and as my reflection mentioned earlier argues, business as usual can result in huge amounts of effort being expended without achieving the intended change. Should we be looking for ways to help people achieve transformation, individually and organisationally? The nebulous term resilience gets harder to define the closer you get to it. But it’s a great discussion starter. What do you think? If learning is so important why don’t we? In the worlds of academia, business and international development there’s a strong emphasis on learning, but does this enable us to change and improve, or just train us in ‘business as usual’? Whilst setting up my ‘inventing futures’ website my Mac laptop threw error messages and Apple directed me to the ‘Genius bar’ at my local Apple store (how’s that for product placement?). Oliver, my allocated Genius, plugged my laptop into their mainframe, scratched his fulsome beard, and concluded the error message was an error. Whilst he was doing this he was constantly dealing with quick requests for advice from his fellow Genies, and also seeking bits himself. He also pointed out a manufacturing fault on the laptop screen and so he logged in my contact information to arrange replacement. Noticing my email address he asked ‘inventing futures – what’s that?.’ I said ‘it’s about creating knowledge which you can use to do things differently and better.’ ‘How do you create knowledge?’ he asked. Looking round me I answered ‘While you checked out my laptop you’ve been constantly sharing information and giving information to each other. It’s not in a manual, it’s stuff you’ve learnt on the job. You and your fellow Genies are creating knowledge.’ Oliver was quite struck by this and said he’d go off and check out the site. It didn’t seem to have occurred to him that they were knowledge creators. What went on at the Genius bar is a small glimpse of the potential of people to create knowledge. It has the potential to happen in many different worlds, and yet in my work in International Development and my earlier work in Corporate Communications I have been told by many people that teaching and training just reproduce the way it’s been done already, and in doing so tend to make those taught and trained think it’s impossible for them – like Oliver and his colleagues – to create new knowledge and understandings. I’ve started writing a paper ‘If learning is so important, why don’t we?’ influenced by a colleague in Uruguay saying that people facing poverty in her country suffer from ‘Learned helplessness’: in other words the usual style of learning and training specifically leads to acquiescence to experts and teachers, a resignation to the status quo, and a lack of self belief in the ability to learn how to influence and change their situations. If you can’t wait to read the forthcoming paper try out ‘The importance of critical thought for change agents’. If you disagree, agree, or want to know more I’d love to hear from you. What ideas, methods and experience form the basis of Inventing Futures? How can they be applied in practice? 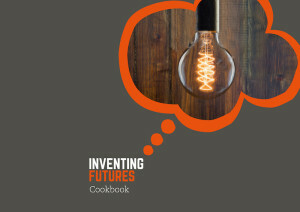 The Inventing Futures Cookbook is being developed as a way of answering those questions by Terry Gibson with designer Mike Thorpe, using an accessible infographic approach. Reflective practitioners and inventing futures. Do you ever feel that you’re running and running and in reality you’re standing still? You might reach a Friday evening after a busy week and think ‘what’s that all about?’ or you may look back over a more distant horizon, several years of your life, and wonder whether anything’s changed. A Tanzanian leader I respect said to me once that after a quarter century working in a poor region of Tanzania leading a development agency he wondered if anything had really changed. If it matters to us to make a difference then we need ask a few questions. Stop a minute and think . . .
. . . ‘Reflective Practitioners’ is a term coined by Donald Schon in a book of the same name to talk about the fact that practitioners – people doing professional or practical jobs – ought to build in reflecting on what they’ve done, learning from it, innovating, inventing and doing things differently. Apologies for the ponderous term, which is really describing ‘learning from experience’ or ‘learning on the job’; ‘inventing futures’ in fact. He wrote the book because he thinks very few people do this. Ring any bells? If it does here’s a piece I wrote for a lecture at a South African university to a whole bunch of development workers. Whilst it’s for a particular audience it applies much more widely. I’ve realised more and more that knowledge – useful knowledge we can use to change things – is a confidence thing. It’s not about ramming lots of facts into ours, or anybody else’s heads, its about developing the confidence to create and use knowledge. Here’s an illustration to show you what I mean. On one of my overseas trips I went to the Mosquitia rain forest of Honduras in Central America – the mosquito coast. The people living in the forest, the Misquito Indians, faced the problem that their habitat was being destroyed by American logging corporations cutting down the valuable hardwood. This carried on partly because the Honduran government was short of cash and turned a blind eye and partly because the locals had no legal rights to their land. A local development organisation figured out that if they could help them get legal rights they could defend their land. The problem was that not only did the locals not understand law, they were mostly not even literate. The organisation worked with one group for a year or more until they finally succeeded in getting deeds to their land so they figured it would be a good idea to share this learning. They filmed it and shipped a video player upstream on a dugout to another village with the idea of learning from the video case study so they could do it in the second village. What they told me was that more than the practical information in the film the villages said when they saw it ‘they are people like us and they did this so we can do it too’. What this reveals that learning from experience, innovation, invention is all about confidence. As people take the first steps into reflecting, thinking, questioning, developing new ideas, experimenting, trying them out, they start to move from being passive – what a collegue in Venezuela called learned helplessness – to confidence and action. I’ve seen this happening in Ethiopia, in Cambodia, in Bangladesh, and around where I live. Just taking a small step based on this and realising that they’ve taken their own initiative build confidence to take the next step, to go the next time round the circle. People coming out of paid-for private education often have that confidence thing. Top private schools produce better academic results than their state counterparts but alongside the smaller class sizes and other benefits what you see – when you look around at the predominance of privately educated politicians, business people and so on – is that aura of confidence. My Mosquitia story showed how people with no education at all, let alone a private education, got that same confidence from seeing that they, and people like them could learn and act.